Infinix Hot 5 X559 was made official last month, August 2017 to be precise. The device is now available in the African market, including Nigeria. 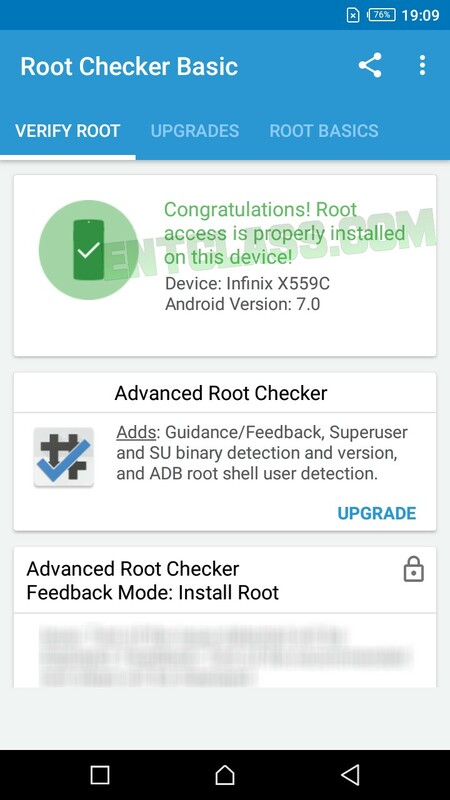 After buying the device, some users have been trying to root their Hot 5 X559 using KingRoot app and the likes of them but all efforts proved abortive. If you have been looking for a way to root your Infinix Hot 5 X559 device, then you are in the right place. Infinix Hot 5 X559 runs on Android 7.0 Nougat which is not rootable using any Android app, but don't worry, i got your back. Yes, you can root it and enjoy more exclusive features. In this article, I've provided the available tools to root your Infinix Hot 5 X559 running on Nougat. Kindly follow me step after steps. Patience in following the guide below. DISCLAIMER: I or Entclass Blog won't be held responsible for any damage caused by you while following this guide. Step 1: Firstly, install VCOMM Driver on your PC by following this tutorial here. Step 2: Secondly, download SuperSU 2.86.zip here and move it to both the memory card and internal memory storage of the phone. Step 3: Now, download TWRP for Infinix Hot 5 X559 from below. 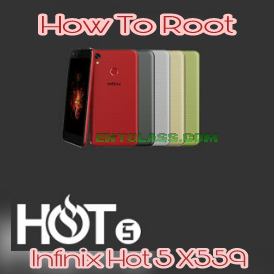 >> Instead of following all the steps in this article, smply download the root packages for Infinix Hot 5 X559-H8015C-N-170719V71 and follow the instructions contained in the readme.txt file. The package contains scatterfile + TWRp + STOCK recovery and SuperSU. 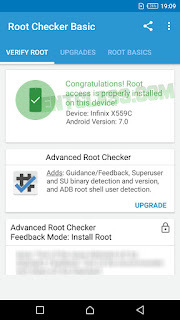 Download Root packages for Infinix Infinix Hot 5 X559-H8015C-N-170719V71 Here. Follow the instructions carefully and you are good to go You don't have to follow the steps here again. Step 4: Now, switch off your phone and flash TWRP recovery.img to the phone using SP flashtool, follow the guide here. Step 5: Now, boot your phone to recovery mode (use volume up button + Power button). Step 6: Tap "NO" if TWRP prompt to root the phone and tap "KEEP READ ONLY" if prompt asking you to swipe to allow modification of the System partition. Step 7: In TWRP recovery, tap "INSTALL" and locate/select the SuperSU 2.86.zip file and swipe to confirm flashing. Step 8: Now, wait till the flashing is complete and reboot normally. Then, confirm your root status using root checker app. Now, you have successfully rooted your Infinix Hot 5 X559 running on Nougat and can now enjoy exclusive features. After rooting the device, you cannot just factory reset your phone to unroot or else, you will brick your phone. Follow this Guide on HovaTek. There is no special feature around right now. So why root a phone? With all these tiresome steps. I would rather not root it. Good information, keep it up. Please the TWRP folder in the root package for infinx hot 5 is passworded, what's the password please? Sorry this is an old post. I might have misplaced the password.